If you wish to apply for child support payments on behalf of a child who is yours in Wisconsin, you may file the application discussed in this article. 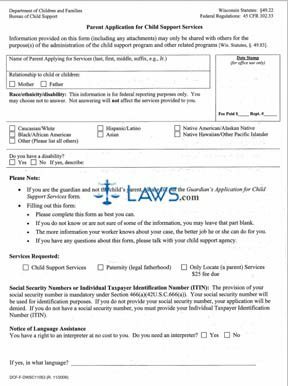 This form is available on the website of the Wisconsin department of children and families. Wisconsin Parent Application For Child Support Services Step 1: At the top of the first page, give your full name and relationship to the child. Note and describe any disability. Entering your race is optional. Note with check marks all actions you are requesting. Indicate if you need an interpreter. If you believe someone who was not your husband is the father of the child, give their name and contact information where indicated. Wisconsin Parent Application For Child Support Services Step 2: Section one asks you to provide information about yourself and your employment. Section two requests the same type of information about the other parent. Wisconsin Parent Application For Child Support Services Step 3: Give all information requested about minor children in section three. Wisconsin Parent Application For Child Support Services Step 4: In section four, indicate the current status of your relationship with the other parent and enter information about any child support order already in effect. Wisconsin Parent Application For Child Support Services Step 5: In section five, give information about any children you or the other parent have from other partners. Wisconsin Parent Application For Child Support Services Step 6: Read, sign and date page six. Complete the additional sheets if you wish to provide more information about your case. Add as many as you feel is necessary.